Snack Girl decided to go on the hunt for a sale on cans of pumpkin. She found enough to continue her quest for great pumpkin recipes. Why add pumpkin to your food? After creating a no bake pumpkin cookie and a pumpkin smoothie (see below), I decided to try a savory dish. This chili recipe below is the healthiest chili (with meat) that I have ever made. It boasts 28% of your daily value of iron, 45% of your daily value of vitmain C, and 293% of your daily value of vitamin A per serving. I am feeling that I may be out of pumpkin ideas, except for maybe a pumpkin pancake recipe. That could be fun! What do you think? What else could I try? Love pumpkin!!! I can't get enough of it!! Your chili sounds amazing!!! Can't wait to try this. I'm on my 3rd batch of your no bake pumpkin cookies. Love them. How about how to can fresh pumpkin? My mom makes her pies with fresh pumpkin so I thought I'd can a little this year. Once you bake the pumpkin on a cookie sheet it pretty much just scrapes right off. I'm not a pumpkin fan but, I think I might try to incorporate it into some of my other recipes. Pumpkin pancakes sound wonderful! I would love a healthy protein packed pumpkin bread or muffin. I have upped my running distance and would love a pumpkin post run snack! Thanks for sharing all your tips and recipes! Two years ago my grocery store ran out of canned pumpkin. There was apparently a shortage of pumpkin that year. I now keep a supply in the pantry just in case; I don't want to run out ever again! Hi there, Thanks for the cookie recipe. Besides pancakes & waffles, I use chunks of pumpkin in pasta with basil, muffins & bread. You can use it whenever a recipe calls for a winter squash especially butternut. wow! this is so simple and looks amazing! i can't wait to try it. I prefer to have roasted squash soup, but pumpkin soup is also yummy, creamy, delicious, healthy, and easy to make if you used can pumpkin. Pumpkin+veggie broth+spices=soup! Ellen - Pumpkin goes great with Cheddar cheese. Pureed & mixed w/2 kinds of cheddar (sharp, mild, whatever you like) is heavenly mac n cheese. I like adding spinach to mine. I love your overnight pancake recipe and would be in heaven if you came up with a pumpkin version. I love that you are doing Pumpkin recipes every Monday throughout fall. Great idea! I just had some this weekend at Pumpkin Fest in Morton, IL. One of my favorite fall traditions! 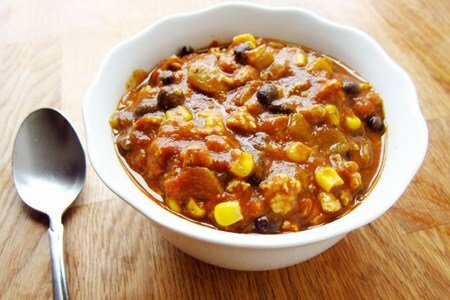 You can really add a can to just about any chili recipe, but something with chipotle is extra good. I am LOVING these pumpkin mondays!!! Please keep doing it! Still lots to do with pumpkin... soup, roasted (yumm)... i had a great recipe for a pumpkin & blackbeans stir fry that I cannot locate. Lisa - this looks yummy. Can you tell us what the point count would be WITHOUT the turkey (or any meat at all)? I love pumpkin! I recently made pumpkin cheddar empanadas on salty/sweet dough and they were fantastic. Also black bean-pumpkin enchiladas are awesome. I'm looking forward to more great recipes!!! i am going to start this in about ten minutes..i can taste it already! adding some smoked paprika to boost the no beef! I also added pumpkin and allspice to your overnight pancake recipe (instead of the yogurt), and my kids loved them! Great autumnal treat, even though it technically isn't autumn yet! !